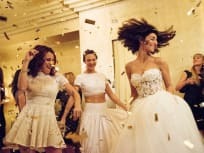 "Rule #519: Happily Ever After is an Oxymoron"
On Girlfriends' Guide to Divorce Season 2 Episode 13, the wedding continues and Jake returns. Find out what else happens on this season finale when you watch! On Girlfriends' Guide to Divorce Season 2 Episode 7, just as Jake gears up to leave for Latvia, Abby's parents show up and make an odd request. "Rule #25: Beware the Second Chance"
On Girlfriend's Guide to Divorce Season 2 Episode 6, Abby runs into Dr. Harris when she heads to New York City to sell her book to publishers. "Rule #72: It's Never Too Late to Be a Mean Girl"
On Girlfriends' Guide to Divorce Season 2 Episode 5, Abby goes on a second date with Dr. Harris while Pheobe gets a 1990s themed prom when she gets her GED. "Rule #605: You CAN Go Home Again"
On Girlfriends' Guide to Divorce Season 2 Episode 4, "Rule #605: You CAN Go Home Again," Abby and Jake redefine their relationship status by spending a weekend at home. "Rule #8: Timing is Everything"
On Girlfriends' Guide to Divorce Season 2 Episode 3, it's time for Gordon and Delia's engagement party and for Abby to find out about Becca! "Rule #77: Don't Blow the Bubble"
On Girlfriends' Guide to Divorce Season 2 Episode 2, Jake and Abby try and keep their secret relationship hidden while her managing editor SheShe pushes her to go out on dates to drive attention to her new blog. "Rule #58: Avoid The Douchemobile"
On Girlfriends' Guide to Divorce Season 2 Episode 1 Abby gets a job offer promoting her views on divorce even though hers is anything but normal. Jake: You know, at a certain point, we're actually going to have to talk about what's going on here. Abby: I know. Can't we just keep it secret and delicious for now? Jake: So I want to talk about our relationship and you don't. We are truly Jake and Abby 2.0. Permalink: So I want to talk about our relationship and you don't. We are truly Jake and Abby 2.0. Secrets kill, Jake. Secrets kill. Permalink: Secrets kill, Jake. Secrets kill.